While unveiling various other gadgets, Google announced the Pixel Buds at their October 4th event in San Francisco. These wireless earbud-style headphones are particularly interesting thanks to their ability to offer real-time language translation via Google Translate when paired with a Pixel 2 or Pixel 2 XL. At the event, Google offered an impressive demo of the translation capabilities, with one user speaking in Swedish and the other replying in English. When the Pixel Buds went up for preorder on the Google Store, they quickly sold out — but starting today, we have a new purchasing option. Pixelbuds Demo From the Google Pixel Event on October 4. 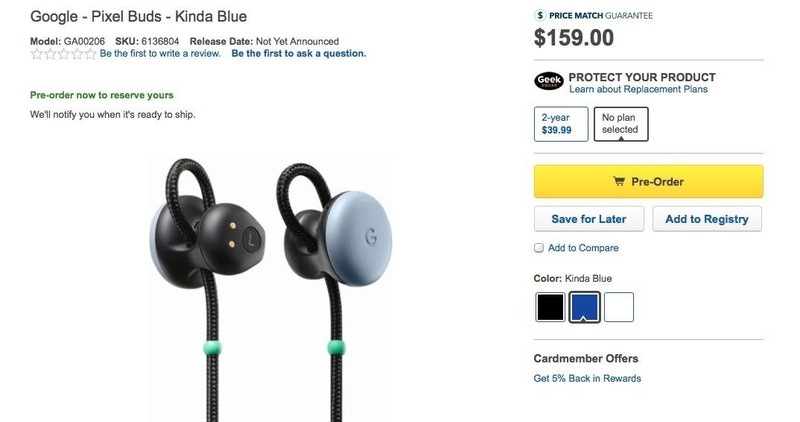 If you missed out on the original Pixel Buds preorder, Best Buy is now offering the headphones for preorder in all three colors: Clearly White, Kinda Blue, and Just Black. The price is $159 for all color variants, the exact price you'll find on the Google Store as well. The unfortunate downside here is that Best Buy does not list an exact shipping date for the headphones. On the other hand, the only thing you can do on the Google Store at this time is join a wait list, so at least Best Buy will let you guarantee a pair today. Aside from the translation capability, the Pixel Buds also feature native Google Assistant integration with touch controls. This allows you to activate Assistant with a tap and access all of your notifications, even reply to emails or text messages as they come in. The headphones also come bundled with a charging case (similar to Apple's AirPods), that can store multiple charges without needing to plug in each time. One aesthetic detractor is that the two buds are tethered to one another via a fabric cable, unlike the more svelte AirPods. Perhaps the benefit of this is that the buds will fit more securely in the ear canal. I'm personally looking forward to checking out the Pixel Buds in person, and placed my preorder for a Kinda Blue pair today. Are you interested in Google's new smart earbuds? Can the translate capability perform as well in a real-world setting? Chime in below with a comment! Black are no longer available for pre-order at Best Buy; Blue and White still are. Verizon also has Pixel Buds, including black, for pre-order. You do not have to be a Verizon wireless subscriber. Thanks for letting me know about the Verizon availability, will get this updated!